About 5-15% of patients having successful cataract surgery will later develop “Secondary Cataract.” This may occur weeks, months or more commonly years, later, even after perfectly performed surgery. This requires a laser treatment (also available at Marin Ophthalmic Surgery Center) to correct. The treatment is quick, painless and highly effective. Very infrequently, a torn or detached retina may follow this kind of treatment. Also very occasionally patients may develop glaucoma afterward. 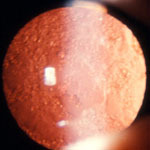 Again, these problems don’t arise very often, and untreated secondary cataract causes progressive vision loss until it is treated with the laser.